Perception is reality, let's change our reality. Men and women enter into relationships for many different reasons, but maintaining them is the tricky part. Recently, some friends asked to hear about expectations in the relationship, new rules in the modern household, and how bringing a child into the home influences expectations. Today’s post will address the former, as bringing a baby into a relationship merits a post on its own. 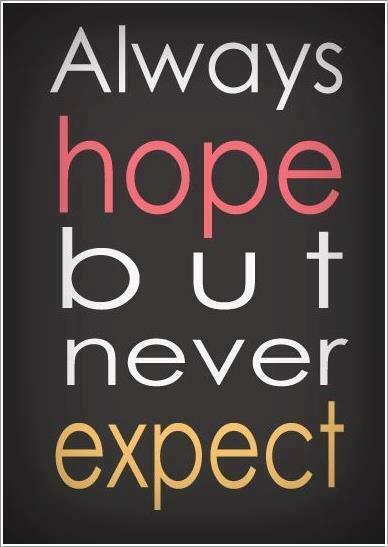 In my last class as a budding counselor, I learned one of my most valuable lessons – Expectations. It really is a loaded word. We discussed expectations for ourselves and the client as well as how to be present with people so that both parties are less likely to be disappointed. When you are present in the current moment, fully engaged, and remove expectations; a space is offered that nurtures mutual respect and encourages growth. Think about when you are learning something new or engaging in a new environment. Be it work, educational, or social; you try so hard to “get it right”, so you are all in your head, working overtime to use the proper procedure, ask the right questions, and deliver the correct results or behaviors. This can happen in a new relationship as well. You spend so much time thinking about what you should do (or what you perceive the other person’s expectations to be), you forget about just being in the moment and being authentic. Or, in other words, you end up “shoulding” all over the place! An example of how shoulding may get you into trouble could be something seemingly innocent – “Sure, I don’t mind eating spicy food”; or “Of course your friends can hang out every weekend.”; or “Getting drunk all the time is no big deal.” Meanwhile, your stomach is a mess, your house is a disaster and full of people, and your partner is wasted or hung over more frequently than you are comfortable with. Allowing these thoughts or should’s – I should be a good partner and embrace all aspects of my love interest or I am a bad girlfriend/boyfriend; I should be super accommodating and do whatever they want or I am a bad host; or I should like his/her friends or the relationship will never work. If the should takes you away from who you naturally are, or if it feels like your needs are constantly sacrificed due to a perceived need to please someone else, then something may need to change. Shoulds can manifest in an extreme way and dictate behavior that is irrational or harmful. Expressing needs in a healthy way that creates dialogue and negotiation moves thoughts away from the shoulding and closer to a partnership in the here and now. Relationships take work, engagement in the present without expectations, and last but not least – patience. Ever notice when you go into an argument with your mind made up on what the other person is going to say, how you rarely hear what they actually say? The wall has to come down. When you are in it, take a moment to breathe and think about what you are truly disagreeing about. Experience what is happening here, now, in this moment. In the scheme of things, is it that big of a deal? Do you NEED to be right? What price will you pay in the relationship to make sure every hurtful thing you are thinking is said? What better use of your energy could you expend by working together to solve the problem at hand. We are not all robots, learning new ways of communicating takes time and practice but could save you much more in the long run. To avoid the mess that comes with shoulding, I recommend developing open lines of communication, sharing what is important to you and listening to what is important to your partner. Then developing a plan of action you can both agree to. There is a great article from University of Texas’ Mental Health website that gives you a play-by-play in building healthy communication from the start. A tool that worked for my husband and I involved a sit down with a little pen and paper. When in doubt, write it down! When we moved in together we seemed to constantly argue about chores. He grew up in a home where the women took care of all the inside work and the men took care of all the outside work. My stepdad was disabled and took care of most of the housework. So, we both had unrealistic views of how our home should be taken care of in a marriage. One day after we just could not agree, we sat down and wrote down all the chores we could possibly think of. Then we negotiated on the activities we didn’t mind doing and others that we abhorred completing. My Achilles’ heel is dishes. As a kid, this was my chore, and as an adult I appreciate that my husband doesn’t mind this duty. He hates cleaning bathrooms, so I take on this responsibility. There are other chores we tag team, but the point is when we sat down and fleshed it out, we shared our beliefs, our childhood, why we liked or disliked certain things and worked to develop a plan that we could both live with. Instead of holding on to what we knew to be true based on our upbringing, we created a new reality that isn’t based on preconceived expectations, but on a way of life where both our needs are communicated, heard, and met. No one can truly answer what will work best for you and your partner. There is no clear-cut normal, but a home that centers around a loving environment that enables all parties to be accepted for their authentic selves and encouraged to grow while maintaining a safe, healthy life is a place where people will thrive. Please share what has worked for you in your relationships. This entry was posted in Being Present, Communication, Life lessons, Love and tagged communication, DPchallenge, expectations, family, here and now, Love, mindfulness, perception, relationships. Bookmark the permalink. © Melissa Cooper of missycooper.com and Counseling and Life, 2011-2013. Unauthorized use and/or duplication of this material without express and written permission from this blog’s author and/or owner is strictly prohibited. Excerpts and links may be used, provided that full and clear credit is given to Melissa Cooper of missy cooper.com and Counseling and Life with appropriate and specific direction to the original content. Psychotherapy in the Bay Area and beyond.